The Mishimoto performance aluminum radiator for the 2003-2008 Hyundai Tiburon is the ideal upgrade to the stock Tiburon radiator. Designed and engineered to maximize cooling efficiency by up to 30%, boost engine functions and most importantly protect your car from overheating. The Mishimoto Hyundai Tiburon radiator features a lightweight dual core, 100% brazed aluminum, and polished end tanks. Every Mishimoto Performance Radiator is a direct OEM fit making installation effortless, no cutting or modification is required. 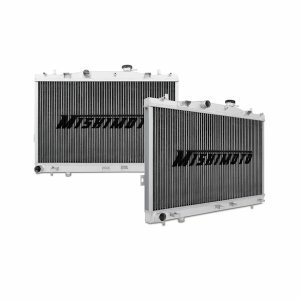 All Mishimoto radiators come with a limited lifetime warranty.